A couple of new reviews just in for the new Caul album Let the Stars Assume the Whole of Night on Hypnos. The reviews are by Morpheus Music and Sonic Curiosity. Melodic brooding ambient with occasional beats. Let The Stars Assume The Whole Of Night is not one of those ambient albums of drifting, minimal drones or spacey expanses and tribal beats. Actually Caul here reminds me of some of the experimental music of the early 1980s on labels such as 4AD – individual in nature and quite personal; unfettered by genre limitations; dark and mysterious; more guitars than most ambient. Opening with mournful cello strains and strummed chords, A Clear Eye Loves The Shadows As Well nicely sets the tone for the album: melodic and harmonious yet restrained and simple. Track two opens with a light beat and the kind of baleful bassline that would be at home on many a goth-oriented 80s piece developed with delicate chiming tones, and lazy electric guitar. At times prowling through shadows and cinematic in scope; sometimes isolationist and bleak with haunting mechanics and sonic disturbances; sometimes nostalgic and dusty with reverb, sombre piano phrases repeating and evolving. This is a unique album, carefree and confident in its expression. Let The Stars Assume The Whole Of Night is a tidy digipack presentation of two panels; disc held in a plastic grip on the rightmost panel. Artwork is a grainy still life photograph of wooden boards, folded drapes and thorny twigs cast upon with stark shadows. A flat black border running horizontally along the top crosses both front and back when opened out. The rear mirrors the front cover in a more subdued, ghostly hue of pale green. Track titles with times alongside are here. Inside the left section provides minimal information: brief credits, contact details and thanks. The inner imagery is of a more abstracted nature – corrosive colours and ragged textures – intriguing shapes. A variety of instruments are employed in conjunction with electronics to generate soothing tuneage. In one track, piano delineates passages of delicate resonance. In another, guitars establish a mildly bouncy mood. One piece flourishes with cerebral cellos, while another utilizes the darker timbre of bass in tandem with crisply twinkling keyboards to create a gentle flow. Another track combines soft violins with heavenly chorales to achieve a celestial demeanor. While another piece takes a dark turn with remote percussives, grinding guitar chords and ominous tonalities, all of which accomplish a pensive mood more than any sense of dread. While electronics are definitely present (often in a subtle fashion that serves to mesh everything together) their presence is generally too subliminal to clearly detect. There are several great, long-standing radio shows featuring the kind of music Hypnos releases. We appreciate all of them, yet airplay on the syndicated Hearts of Space show seems to be hardest to come by. 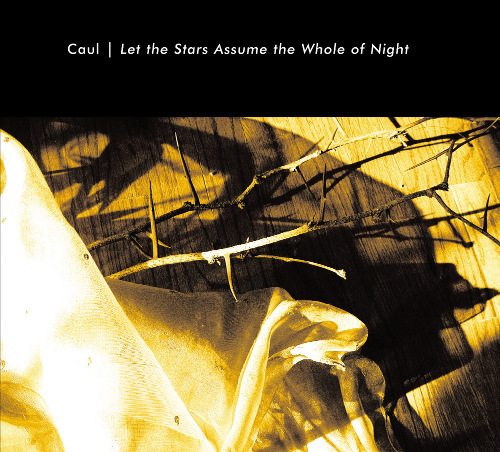 We’re very pleased to see three tracks (opening and closing the show) from Caul’s album Let the Stars Assume the Whole of Night on the latest Hearts of Space. Our thanks to Stephen Hill and Steve Davis of HOS radio, and congratulations to Caul for this big chunk of national airtime!